I dont know about you, but i have spent the last 4 weeks purging and cleansing after a summer full of indulging, partying and eating anything and everything. This time of year, after the fall equinox in late September, not only have I re-organized my pantry, kitchen cabinets and clothes closets, I have also committed to eating less sugar, less bread and allowing myself only 1 day a week to indulge and reward myself to a glass of wine, or a sweet treat. 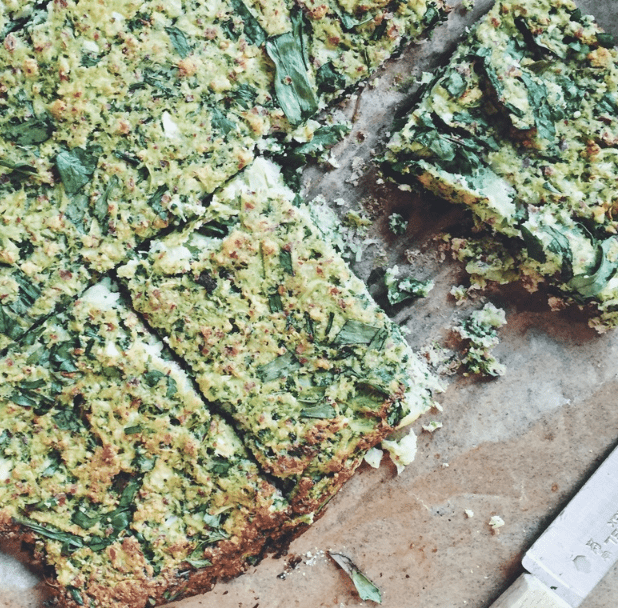 Testing recipes for my next cookbook project i want to share these brilliant and ever so simple recipes with you, Broccoli Flatbread with Broccoli Pesto. Just dig your food processor out of your cabinet and make it your favorite front and center kitchen appliance to make this amazing flatbread. Afterward, give the processor bowl a quick rinse and pop it into the top rack of your dishwasher with the lid and wash so its ready to use for your next batch. Trust me, you will want to make this weekly. Place everything into a large mixing bowl and mix very well. Bake for 30 minutes. Remove from oven and cut into into four x eight pieces as desired. Cool completely and carefully peel baking paper away from flatbread. Spread with your favorite toppings. Store in an air-tight container and refrigerate any leftovers. In the bowl of a food processor, pulse the pumpkin seeds and walnuts, until crumbly. Add combine broccoli, basil, garlic, salt and olive oil and pulse until combined. Store in the frig in an airtight container up to 1 week. This is a vegan recipe but feel welcome to add 1/2 cup grated Parmesan if you like and blend until combined.